BACK PORTRAIT #6, 2000 - oil on copper - 17 x 19 in. BACK PORTRAIT #10, 2000 - oil on copper - 17 x 19 in. 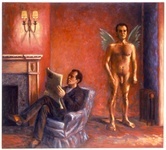 CROUCH, 1998 - oil on canvas - 42 x 60 in.